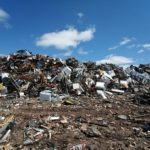 Some interesting articles on landfill mining and it’s potentials as well as the issues regarding SA’s landfill situation. “With landfill space in South Africa at a premium, the controlled, planned, and systematic filling of landfill cells requires progressive closure and rehabilitation. This is a highly specialised endeavour that requires an integrated infrastructure delivery company like AECOM to drive it. Landfills may need to be closed for various reasons, including unacceptable environmental impacts such as groundwater pollution, and/or unmanageable air pollution such as dust or odours. Geological issues include dolomitic ground conditions, which can result in water ingress and sinkhole formation. In many instances, improving landfill management and operations is a necessary first step, but if this proves unsuccessful, closure becomes necessary. Landfills are usually designed with a specific lifespan, determined by the volume of waste that can be handled. Once filled to capacity, landfills must be closed and decommissioned, as stipulated in the Waste Management Licence. However, effective landfill remediation poses a challenge for both public and private entities. Navigating the regulatory process, coordinating the different phases of the project, and establishing a long-term plan for post-closure reuse are only the beginning. Landfill site problems are often bigger than the eyesore created by the huge piles of waste. At one point or another, landfill sites will have to be closed. “While this may seem like the end of the story, it is only the beginning of the next chapter in the life of the landfill,” comment Nicolas Vanhecke, Practice Lead: Remediation Services, and Soleil Jones, Environmental Scientist, at AECOM. The process of landfill closure and remediation is legislated by the National Environmental Management Waste Act (NEMWA), the Water Act and the Waste Management Series, as promulgated by the Department of Water and Sanitation. While it might seem that the closure process only commenced once the landfill has reached the end of its useful life, there are factors that can need to be attended to while the site is still operational. The slopes of the waste body must be resolved to ensure they lie at a safe angle. This should be maintained throughout the operational phase, after which capping is carried out by means of an engineered liner. Furthermore, all stormwater run-off must be diverted away from the waste body so as to separate the clean and dirty water circuits, and to prevent leachate soaking into the waste body, which can result in subsequent groundwater pollution and odours. The site must also be fully secured, and access-controlled, in order to prevent trespassers. For example, there could be an issue with people remining the waste body for recyclables, which presents a fire risk, as well as allowing rainwater to permeate the waste body. “In the past, little to no consideration was given to the potential environmental impacts of landfills on human health and the larger environment, which is why today’s landfills are licenced, and with very specific engineering design,” Vanhecke and Jones highlight. The remediation process depends on factors such as the type and classification of the waste, and the size of the landfill. Most of the time, the remediation process consists of waste reprofiling; capping, usually with topsoil such as clay or with a geotextile; revegetating, usually with indigenous grass; and, finally, closure. Once properly remediated, the landfill site could be used for anything from parkland to recreational infrastructure or even grassland, depending on the preference of the landfill owner, the surrounding community, and the regulatory authorities. If the site is smaller, site reclamation can be conducted via an excavation-transfer-treatment process. A key element in site reclamation is the transformation of anaerobic to aerobic conditions in the landfilled waste. Depending on the waste accumulated in the landfill, a methane gas plant can be installed to recuperate methane for energy purposes. Following closure and remediation, the landfill site is subject to a post-closure monitoring period, which is recommended for up to 30 years. This is in order to monitor the integrity of the capping, and the impact of the quality of the groundwater quality in and around the waste body. There may also be a need for ongoing pumping and treatment of the leachate that gathers in the leachate collection system. The landfill will also most likely require a methane management system, whether that be done by landfill gas harvesting, or regular flaring, so as to prevent methane build-up, fire risk, and air pollution. Adherence to legislation is key, and therefore a preliminary closure plan and end-use options for the landfill should be outlined from the outset of the project, and addressed ideally in the Environmental Impact Assessment phase. Financial provision must be made for these engineering works and materials, and a more detailed rehabilitation and closure plan must be developed as soon as landfill operations commence. “For more than 100 years, the world has been discarding its unwanted waste in landfill sites. There are at least 500,000 of these sites in Europe alone, according to estimates by the European Enhanced Landfill Mining Consortium (EURELCO). Only some are still operational.